The tradition of wedding centerpieces has been around for decades but edible centerpieces recently have come into vogue. They are both functional and beautiful to look at and are a great conversation starter. Your guests will be delighted to have something edible to munch on from the moment your reception begins. You can rent or purchase a cupcake tower for each table and have cupcakes in a variety of flavors and styles decorated with your wedding color scheme. To keep the cupcake theme flowing, you can have a larger tier cupcake tower serve as your wedding cake. This is a creative idea that is less expensive than the traditional wedding cake and floral centerpiece. 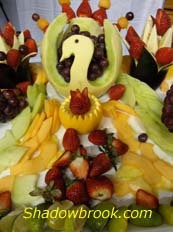 The dieters at your reception will be thrilled if you use fresh fruit as your centerpiece. If you have some time and talent, you can duplicate the picture below using fruits of the season or any fruits that will compliment your wedding palette. Filling a large decorative crystal, silver or gold bowl with candies wrapped in your color scheme will delight your guests that have a sweet tooth. I strongly recommend wrapped candy because most people are germ conscious and will not eat candy that has been touched by others or has been sitting around for awhile. True chocolate loves will especially enjoy an edible arrangement created by using strawberries dipped in chocolate. Place the dipped strawberries onto a skewer and fasten the skewer into a Styrofoam tower. Each guest will remove a skewer leaving the other strawberries untouched. Another amazing idea for a centerpiece is to dip strawberries in different colored chocolate and then place the strawberries on a towering platter. A basket lined with fabric and ribbons that coordinate with your color scheme can be filled with fresh fruit of the season, or individually wrapped pastries. 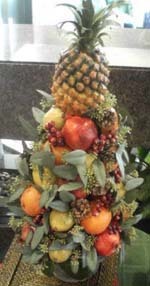 This centerpiece was created by spearing fresh fruit into a Styrofoam pillar. 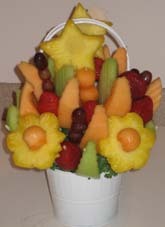 It adds color to your table and serves as an edible arrangement and desert for your guests. 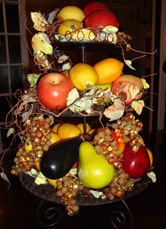 The below centerpiece is so easy and inexpensive to create that you will be delighted to have it at your reception. 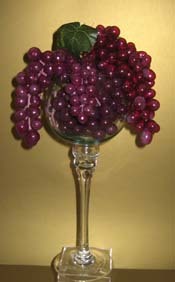 Purchase a tall goblet and place fresh grapes into the top. Any of the above edible centerpieces will certainly be a hit at your reception. Use your imagination and let your creative juices flow to help you make a spectacular edible wedding centerpiece. My introductory page has many bridal ideas that are unique. Take a peek!